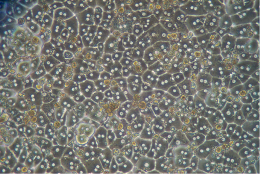 Following up on my series of posts based on Dr Chris Bohl’s work at Sekisui Xenotech, in this post I invite you to take a look at the work he has published, together with Dr Christopher Seib, Maciej Czerwinski, Zell Woodworth and David Buckley, Ph.D., illustrating the characterization of isolated human liver lysosomes, and validating them as test systems for in vitro assessment of catabolic stability of biologics drugs entering the cell by the endosomal–lysosomal pathway. 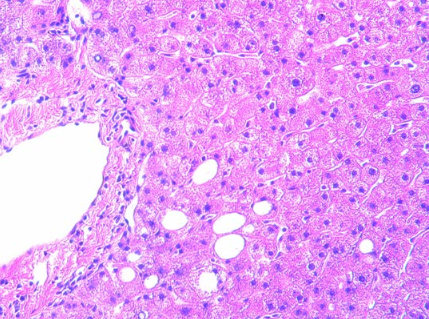 Purified rat liver tritosomes or human lysosomes are convenient test systems for an in vitro evaluation of lysosomal stability of antibodies, linkers and small molecule drugs comprising Antibody-drug conjugates (ADC). 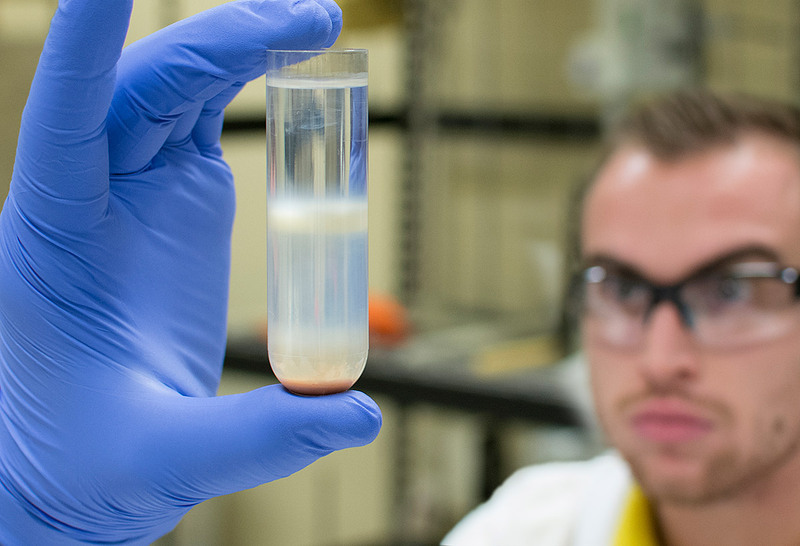 Indeed evaluation of lysosomal catabolism is an integral part of the development of biologic drugs which enter the cell by fluid-phase or cell surface antigen-mediated endocytosis and can be degraded by multiple catabolic enzymes found in lysosomes. In the work from Dr Bohl (et al.) 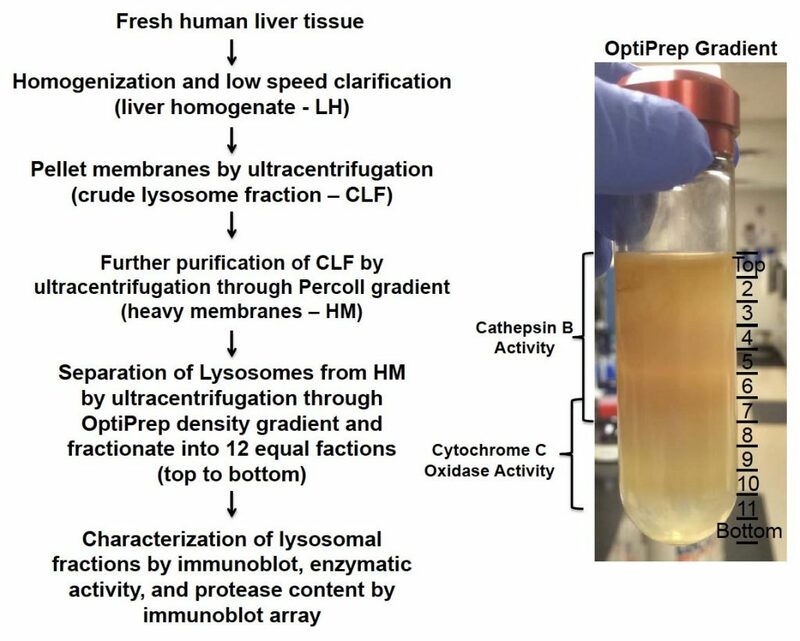 I am presenting here, hepatic lysosomes were isolated from fresh human liver donors according to the discontinuous density ultracentrifugation method based on Wang, et al (2012). 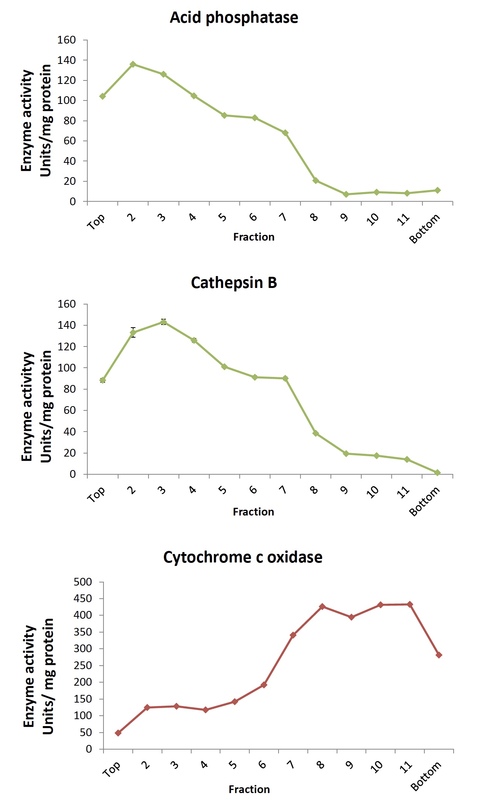 Twelve individual fractions collected from the OptiPrep density gradient were characterized for acid phosphatase, cathepsin B, and cytochrome c oxidase activity in order to confirm separation of the lysosome- from the mitochondria-specific proteins. Acid phosphatase activity was distributed among multiple fractions while cathepsin B was higher in lighter lysosomal fractions in contrast to the heavier fractions containing more cytochrome c oxidase (Fig. 1 below). Fractions were further characterized with Western blotting for distribution of lysosomal-associated membrane protein 1 (LAMP-1, CD107a) and microsomal cytochrome c oxidase subunit 4 (COX4). In agreement with the enzyme activity data (see Figure 2 below), the blots demonstrated separation of the LAMP-1 signal, detected in the lighter lysosomal fractions from that of the COX4 signal found in the heavier lysosomal fractions of the OptiPrep density gradient. Expected enrichment of lysosome-specific cathepsins L and S in isolated lysosomes was also demonstrated (click on this link to access and download the full data). 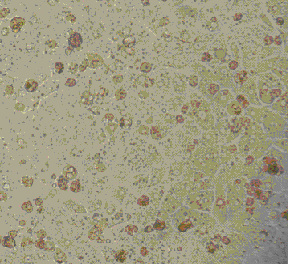 This work provides a characterization of isolated human liver lysosomes that constitutes a test system for an in vitro assessment of catabolic stability of biologics drugs entering the cell by the endosomal–lysosomal pathway. I’ll be happy to address any questions you may have on this work, in collaboration with Dr Chris Bohl, the first author of this poster.